The student of Unpad’s Animal Husbandry, Farid Akbar, has successfully won the first place of the Ninth National University Pencak Silat Competition in Universitas Pembangunan Nasiona “Veteran” Yogyakarta from 19 to 25 November 2017. Visiting Humas Unpad’s office in the Rectorate Building Jatinangor on Thursday (30/11), Farid admitted that he was glad to win the championship. In his last year as bachelor program student, he is able to contribute to the long list of Unpad’s National achievement. “I am glad to win, this is my last year (as Unpad’s student), and my practice is never this exhausting before,” Farid said. Farid is a champion in Male Class H Match Category. He won the competition after defeating Tarumanegara University in the final round with 5-0 score. Previously, in preliminary round, Farid was able to win KO against Semarang State University. He believed that the strength of his right jab and left sickle kick have been his main advantages. Since in senior high school, there are several achievements that Farid gained in Pencak Silat. “My advantage is in my power,” added the young man who is also active in Unpad’s Merpati Putih Unit. Farid stated that in the national competition, there are two categories, Match and Aesthetic. Unpad was sending 13 of its best athletes to the competition, 4 in the Match category and 10 in Aesthetic while 1 athlete competed in both categories. 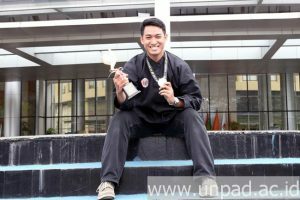 To enter the competition, Farid together with Unpad’s Pencak Silat Unit had been training for two months. The training includes basic technic mastery, physical strengthening and combination technic mastery. It was done with 3 coaches that are Pencak Silat athletes who are also Unpad’s alumni. “I expect there will be more Unpad’s student to enter Pencak Silat competition. Hopefully to become the winner and improve the overall spirit,” Farid closed.